When it comes to motion capture technology, the leg bone isn’t always connected to the hip bone – sometimes it gets connected to the elbow or the face bone. That’s not quite how everyone’s favourite children’s song about skeletal anatomy goes and it’s not acceptable for Peter Zion either. As co-founder of The Navarra Group, a Web and mobile application developer based in Montreal, he needed to help a Toronto games studio get high quality motion capture data without hours of manually correcting the footage. Motion capture is a technique now commonly used by many movie and video game studios. An actor is filmed with several captures performing acrobatic manouvers and the data transformed into a format that can be applied to a computer-rendered character. The technique results in unparalleled realism when it works well. But sometimes it doesn’t. The software doing the translation functions fine when it can see all the limbs of an actor at once. But if a limb is hidden from view, the software loses track of it and starts connecting parts of the body together in strange ways that aren’t so realistic. So usually someone has to sit down and manually fix up the errors of a long motion capture session, Zion explains. 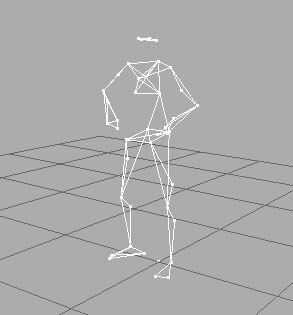 A 3D stick figure helps preview raw motion capture data. That way, producers could determine what sections of the motion capture they did want to use and only clean up a few minutes of footage, as opposed to poring over hours of tedious touch-up work. But The Navarra Group needed some help to make this sort of preview for their client Bedlam Games. It found it in Toronto’s Seneca College, where an open source project has been seeking ways for 3D content to be viewed in Web browsers without the need for a plug-in. Dubbed Canvas 3D JS Library (C3DL), it’s essentially a toolkit for developers to build 3D content without crunching complex algebraic calculations. Researchers and students have been working with Mozilla Corp. on the library and are pleased to see it put to practical use. Navarra Group’s Web application displayed 3D stick figures acting out the motion capture data for Bedlam Games. Producers could pan around and view these stick figures from different angles – an advantage they wouldn’t have if the preview was only in 2D. Producers can view the animation from different angles. Streaming the data over the Web offered both a convenient and secure method, Zion says. Streaming the preview data only means fewer copies of the raw motion capture data – considered valuable intellectual property – and more peace of mind. Viewing it in a browser also means the video can be viewed on any computer with an Internet connection. About six Seneca students were involved in creating the C3DL, Weaver says. The project continues to employ both students and former students who are interested. Funding from the Ontario Media Development Corp. makes it possible to pay graduates on a full-time basis. “A browser is composed of multiple 2D canvases, but now they’ve extended that to expose 3D capabilities,” Weaver says. Anyone running Mozilla Firefox v 3.5 or higher can install the Canvas 3D plug-in to see the project in its current state. A video card with 3D acceleration is required to view content generated by the plug-in. Seneca will be showcasing its library and other programming talents at Markham, Ont.-based Innovation Synergy Centre on Oct. 2. They hope to highlight their work on open source projects and make smaller and medium-sized businesses aware of opportunities to work with the college on computer programming projects. The college already has a happy customer in The Navarra Group. Bedlam Games should be able to use that player to make sure its video game characters have all of their bones in the right place. So no one will have to rewrite songs about anatomy any time soon.